Apologies in advance, but Stuart Hogg is the best fullback Scotland has ever produced. After his latest starring performance against the fearsome All Blacks last weekend, almost single-handedly defeating the world champions, has Hogg etched his name as Scotland’s best? In my humble opinion, yes. Yes, better than Andy Irvine, better than Gavin Hastings, better than Kenny Logan and better than Chris Patterson. Before I get into this, let it be very clear this is not meant to diminish what all those above achieved on the pitch wearing a Scotland jersey. They are all still very much in the conversation as Scotland’s greatest ever fullback, having led the country to countless victories, Calcutta Cup wins, Five Nations triumphs and numerous British and Irish Lions tours. All are still transcendent players who did things 99.99 per cent of other fullbacks simply will never even come close to achieving. However, Hogg is that one player, that one .001 per cent who has. This column is aiming to highlight what Hogg has managed to achieve in his relatively short career, not dampen what those other Scottish rugby greats did. This was probably the case even before Hogg almost single-handedly managed to take down the All Blacks last Saturday at a cold and damp Murrayfield Stadium in a performance nothing short of heroic. However, that game wipes out any claims that Irvine, Hastings, Logan and Patterson has to the throne. It’s Hogg to himself. In his relatively short professional career, he has blazed a trail throughout the rugby world. Having played at all Scotland age-grade levels while starring for Hawick High School, Hawick Wanderers, Hawick and briefly, Heriot’s, signing his first professional contract in 2010, Hogg was eventually selected and earned his first senior cap for Scotland as a replacement against Wales the 2012 RBS Six Nations Championships. So 2013 would prove to be Hogg’s breakout year, scoring two tries and solidifying his place as Scotland’s starting full-back for years to come. His performance earned him a place on the 2013 winning Lions tour of Australia and set him on a trajectory headed for superstardom. More success followed during the 2014, despite earning a red card against Wales for a late tackle on Dan Biggar in the Six Nations which led to a brief dip in form for club and country. Hogg returned to the international fold during the summer against USA and picked-up where he left off. He played a role in Scotland’s 7s team during the 2014 Commonwealth Games, scoring twice as Scotland lost out to South Africa in the medal competition knockout stages. 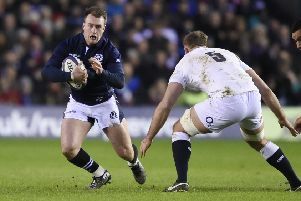 In 2015, as Scotland laboured to a wooden spoon finish in the Six Nations, Hogg stood out, making the most meters for a full-back (442), beat the most defenders (18) and made the most carries (63) in the competition. Hogg went on to lift Glasgow Warriors’ first ever Guinness Pro12 title, not featuring as prominently in the final weeks of the season after flirting with a possible move to Ulster, and helped Scotland reach the quarter-finals of the World Cup. In 2016, Hogg’s Glasgow side fell a game short of reaching their second consecutive Pro12 final, losing to eventual winners Connacht 16-11, but it was internationally where Hogg shone. Widely praised as the best fullback in the world following impressive performances against France and Ireland and was later awarded, through a public vote, Six Nations player of the Championship, the first Scottish player to take home the award. Now on to 2017. Hogg again claimed Six Nations player of the championships as Scotland finished joint second and was selected for his second Lions tour. While the tour did not go as planned for the Teri star, accidentally injured during a midweek match, Hogg returned to action and, after a number of outstanding performances for the club, the former Hawick High School pupil put on a show against the world champion All Blacks last weekend, earning man-of-the-match honours. So while Irvine, Hastings, Logan and Patterson may have accumulated more titles, points and honours, Hogg is arguably achieving more given where world rugby is today, and is still only 25 years old. The age of professionalism had yet to really take hold during Irvine’s and Hastings days, while Logan and Patterson were never considered Scotland’s best during their periods on top. Hogg is reaching the peak of world rugby when world rugby is full of superstars. When the game is full of physical wrecking balls and in an age when every facet of the game is analysed and dissected in an attempt to find an edge. That is why Hawick’s own Hogg is Scotland’s greatest of all time, and why we should all take time and marvel in what this young players has achieved and what the future will hold.